In my last set of products from the Born Pretty Store, I chose some Peacock design nail foils. The package comes with a really long roll of the foil, so there is no worries about ensure you have enough for all your nails. There were some beautiful pictures on the Born Pretty site that showed this foil over pastel shades and natural nails, so I thought I would try it over two darker shades. 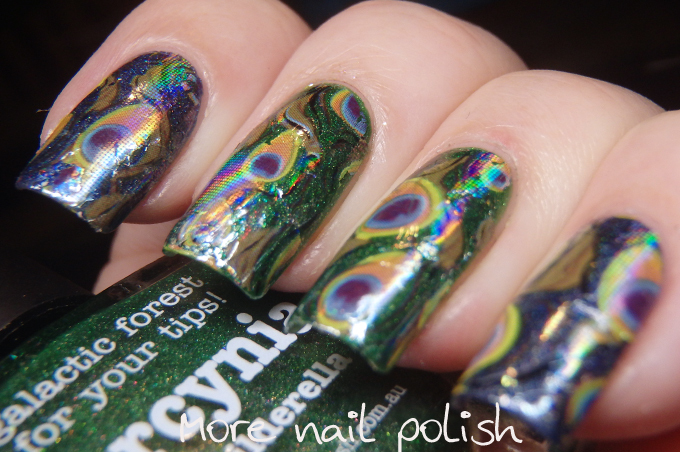 What I didn't realise was that these foils have a full holographic sheen over the entire foil. This reflects light beautifully, but when worn over darker polish it looks rather grey and dull in lower light situations. I painted two nails with Picture Polish Midnite Meteor and two with Hercynia and the design looked pretty over both, although I think my preference was over Midnite Meteor. I also stepped away from my usual go to top coat for nail foils (Picture Polish Revolution) because I was feeling lazy and there was something else in front of me that I thought I would try. Born Pretty store Mirror polish top coat. The one and same that I used as a base coat for the mirror polish here. It worked great, although dry time is an eternity! 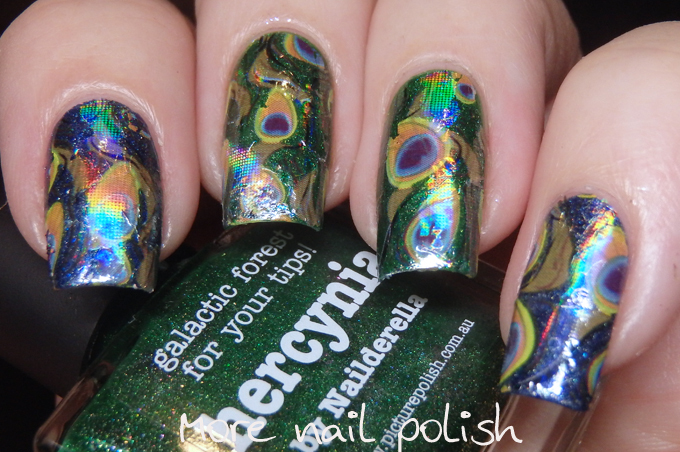 It doesn't wrinkle up the foil and then you can apply a regular top coat over it. 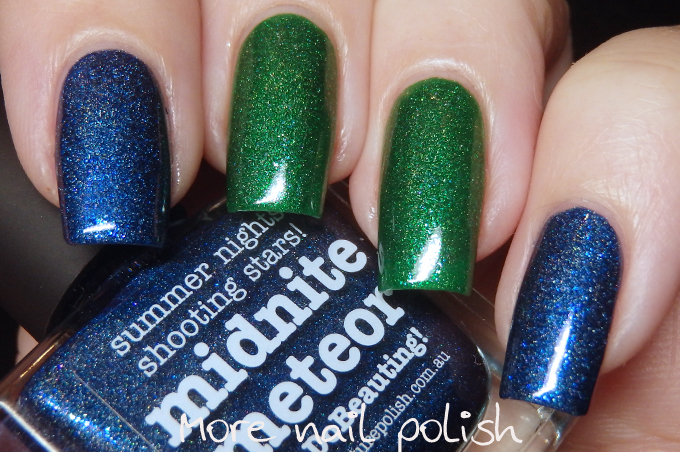 Took a quick photo of Midnite Meteor and Hercynia before applying the foils. Geez, I can't believe how long my nails are here. I cut them all down cause they were starting to irritate me, so I must get all these long nail photos out before I show some shorter nail ones. 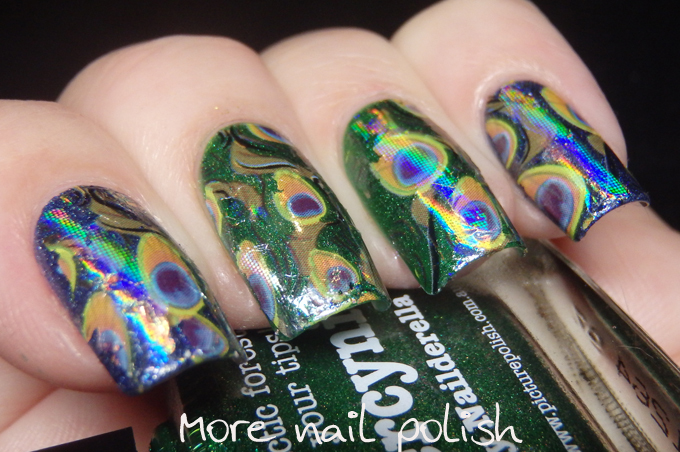 You did such a great job applying these foils!